Hey check out the cover of the next issue of Down Under Quilts. 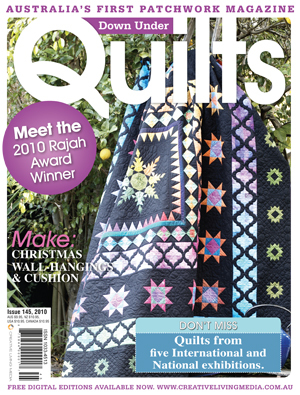 Yes I realise this is a brag but I couldn't figure a tactful way of saying they like my quilt and have put it on the cover!! It will soon be on sale in shops and newsagents. But if you want an early edition then sign up for a subscription either online or hard copy..... both land in the hands of subscribers, before they hit the newsagents. 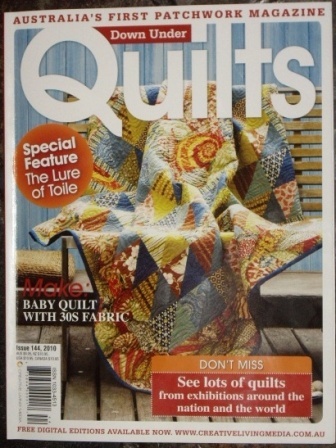 This issue has the first part of the instructions to my Turkish Delight quilt. 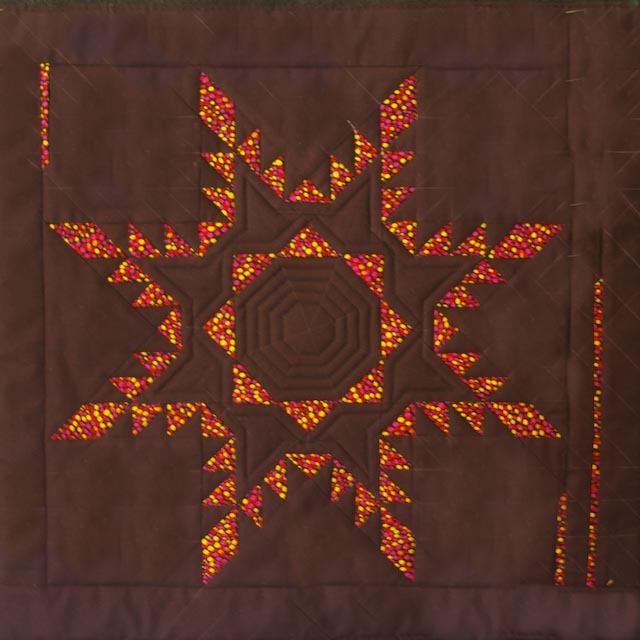 It is made of hand-dyed fabrics in a medallion style with a series of different borders making it up to quite a large quilt. But you can stop before completing all of the borders I did! Check it out and let me know what you think. Pick up a copy at your local newsagent or patchwork shop or go online for your free subscription - visit www.creativelivingmedia.com.au and sign up now. 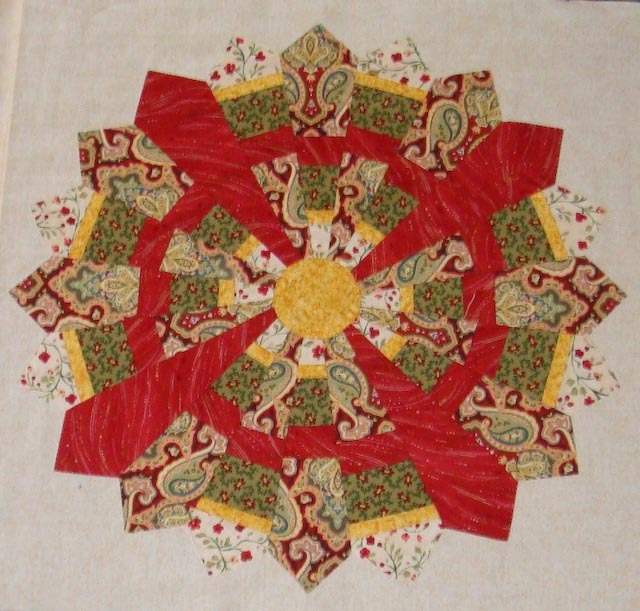 Plus, there are lots of other great projects, fantastic quilts and interesting stories too. PS Take a look at Down Under Quilts' facebook page too!... but I've lost the link... you should be able to pick it up at the creativelivingmedia website. Didn't she do a top job? I think she is making it for one of her grandsons. I can't wait to see it in the flesh... hopefully she enters it into the Sydney show this year. Well thank you to everyone who particiapted in the blog tour. 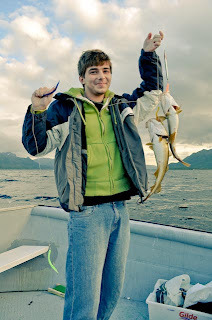 It was lots of fun although extremely hectic as my modem died on Monday night and it wasn't until today... and four modems later... that I have been a ble to reliably connect to the innternet from home. Luckily I was able to keep up to date with what was happening in the blog tour from work, but most days time was limited. Now for what everyone wants to know...my husband chose number 85 as the lucky number and the winner is Susie Rhodes from Fortville IN, don't know what IN stands for but that is no problem as the people fromQuiltmaker are sending her the magazine direct and they are US also:) Thank you again to everyone who entered the tour and the competiton. Looking forward to actually seeing the magazine. It is due to hit the newsagents November 16th in the US, but I don't know when for us in Oz. Well here is another project which I intend to make in the near future. I actually made a rag rug about ten years ago. It was lots of fun and I have been meaning to make another one since. Found these instructions and they show an easier method than my previous attempt so I will hopefully get around to making one of these in the near future also. Tuesday already! I can't believe how quickly today has come around. My blog and website are one of those being featured today on the 100 Blocks Blog Tour. Now if you have arrived here through the main link, you already know about the blog tour and are here for your chance to win your own copy of this fantastic issue. The first issue was a total sell out but is now available as a digital download for anyone who has decided they would like to check it out. There are another two issues in the planning. So if you buy all four you will have 400 new original blocks from both established and new emerging designers. Ok so back to today's entry. 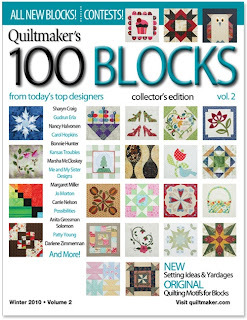 To be in the running for your own copy of Quiltmaker's 100 Blocks Volume 2 simply check out my website and then come back here and tell me which pattern you like the best or which version of Isobel's Flight you prefer. 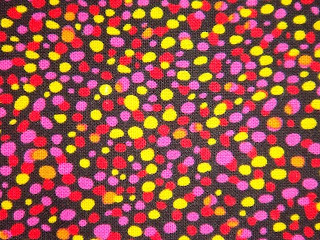 You will need to leave two comments.... the first is the pattern you like best and the second is your contact email so that I can contact you if you win. Please don't put them both in the same comment as I don't like to publish people's emails. 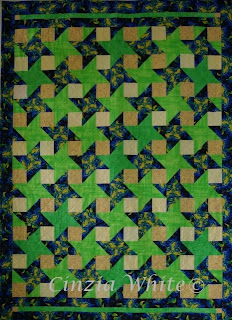 Well here it is my block from the Quiltmaker's 100 Blocks collector's Edition Volume 2. Funny in the small image it looks very higgledly piggledy but in real life it flows really well. 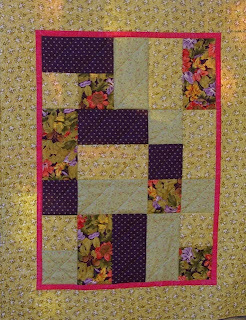 I designed this block for a friend Isobel who wanted to make a quilt for her grandson. 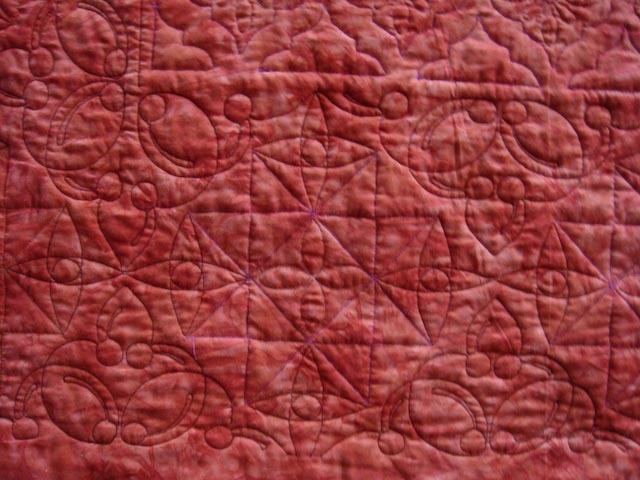 She wanted a design that would flow across the entire quilt. Last year when Isobel wanted to make Pathways she contacted me to find out if it was easily modified for a different size. I replied that it was easily made in any size but if she wanted a different design I had one in my head and no time to make it. Isobel's Flight came from that idea. I have worked out a few colour variations but am desperately looking for time to make what would be to me the best... a completely scrappy version... one day. 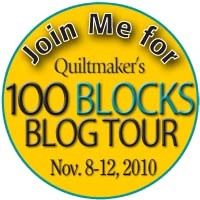 WOW today is the start of the 100 Blocks blog tour, which will be running for the entire week. Every day there will be new blogs featured at this link, so head on over and see which blocks and blogs are featured today. Also check them out to see what you need to do to win your own copy of the magazine. Each and every blog is giving away one copy of the magazine. On the main link there is also the opportunity to win other great prizes... Top way to spend a few hours. My feature day is Tuesday. Now I'm not sure if this is supposed to be Tuesday their time or my time but suspect it should be US time... which fortunately is behind Australia so I intend to post my entry Tuesday Sydney Australia time (+10 hours GMT), but if I am running a little late it should still be up before Tuesday US time :) So head back here on Tuesday for another chance to win a copy of the magazine. 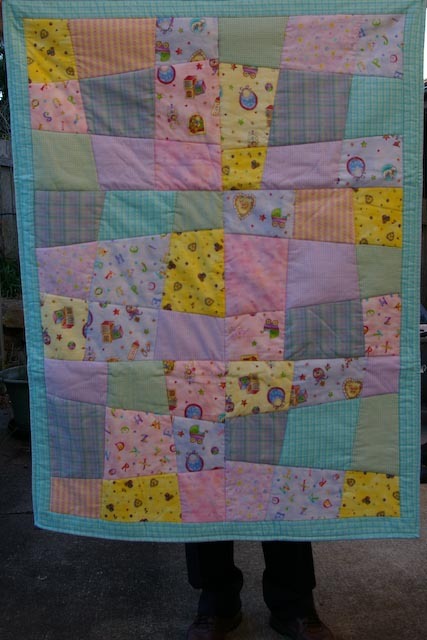 This quilt is called Bubble and Squeak and I made it a couple of years ago when I was into a clean up my scrap pile stage. If you look closely at the individual blocks you will see that they appear to be crazy patchwork style but this is not correct. 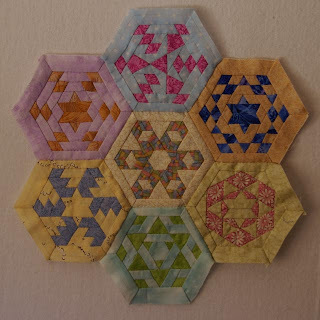 In actual fact the blocks are made using an improvised four patch technique which I have been utilising quite a bit lately as it is perfect for when I feel like doing brainless sewing and when I want to use up scraps. If only I could throw out unwanted fabric it would make life so much easier. The leftover scraps were randomly sewn together to form large pieces of fabric which was then cut into the squares and rectangles. 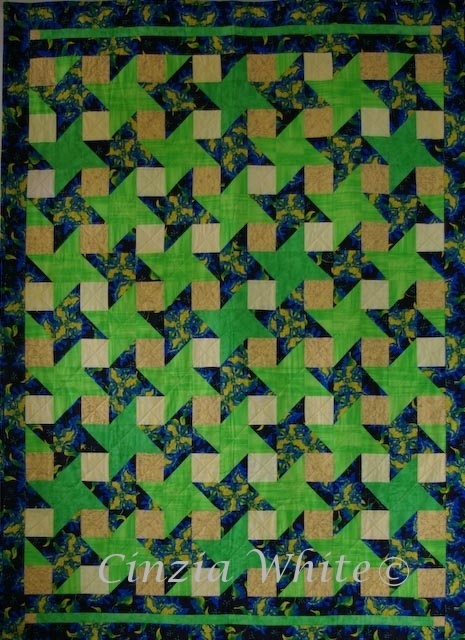 Unfortunately I was a bit brain dead at the time that I started to cut and didn't allow correctly for seam allowances which is why most blocks have a double border on two sides.. never throw out an error when you have a chance to experiment as they say. 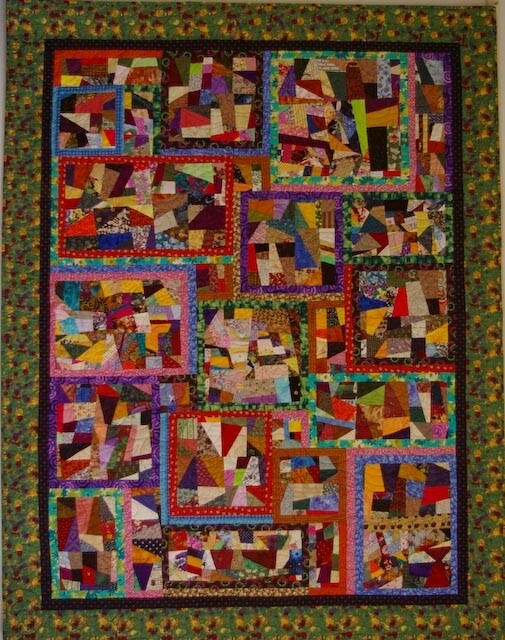 It is one of my favourite quilts. 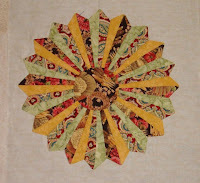 If you want to try the technique I have used it in two projects which are being featured in Australian Patchwork and Quilting. The first was in last month and the project was called Dusting Crumbs and the other will be in a few months in a project called Starry Cabins. Dusting Crumbs uses a few different improvisational techniques whereas Starry Cabins only uses two. 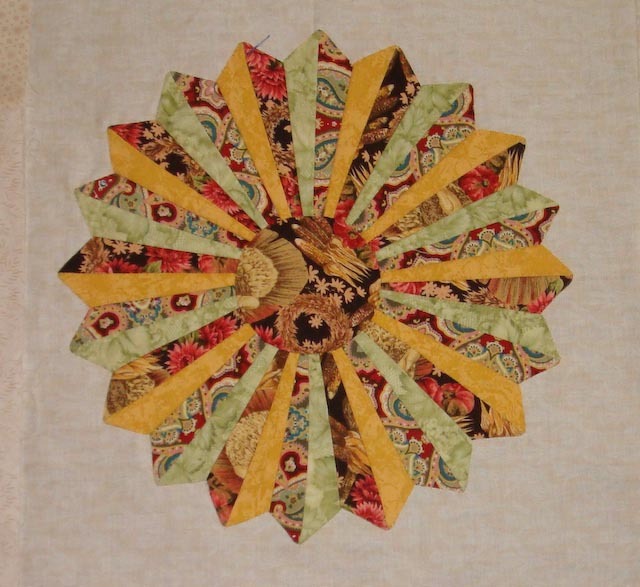 Found a great site today with information on quilt care and storage. Check it out. November 8 -12 is the Quiltmakers blog tour. This is a great opportunity to check out many of the blogs of numerous international and new to the international stage designers. While cruising on the tour... it's free by the way and can be completed totally from the comfort of your own home... you will have many opportunities to win your own copy of the latest Quiltmaker 100 Blocks magazine. If you click the link today you will see the marvellous cover of the magazine and a selection of some of the blocks from inside the cover... mine is not there but it is inside somewhere... I am excited! Late last year Paul and I went on a trip to the US. Great trip and saw lots of wonderful things but that isn't the point of this post. After returning home I went out in my car one day and when I looked in the back seat of my car I was quite surprised to find this large lap sized quilt... almost big enough for a single bed. So why was I surprised to find a quilt there you may ask? Well the thing was I couldn't remember ever seeing the quilt before. 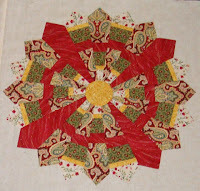 Now I know I am forgetful but I was positive I didn't make it so I took it with me to all of the various quilt groups which I meet with but no one owned up to having either seen it or made it. So there I was with this dilemma... new quilt and no owner. I was trying to clean up my place and organise which quilts would go to charity and which ones would go for gifts and which quilts would go elsewhere. In the midst of this DUQ did a call for quilts for a few themes and I thought let's give it a try. Sent off the picture and surprise, surprise... they liked it. 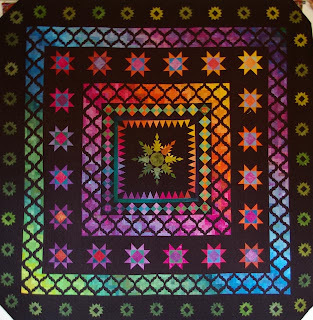 So if you would like to make this starry quilt for someone the instructions will be in this month's edition of DUQ (number 144). If you don't get around to making it and you would like to buy a ticket in a raffle to win it let me know. Tickets will be $2 each and the funds will go to sponsoring hearing impaired primary aged children to attend camp. For many of the children this is the only opportunity they have to meet other hearing impaired children and discover that they are not alone. 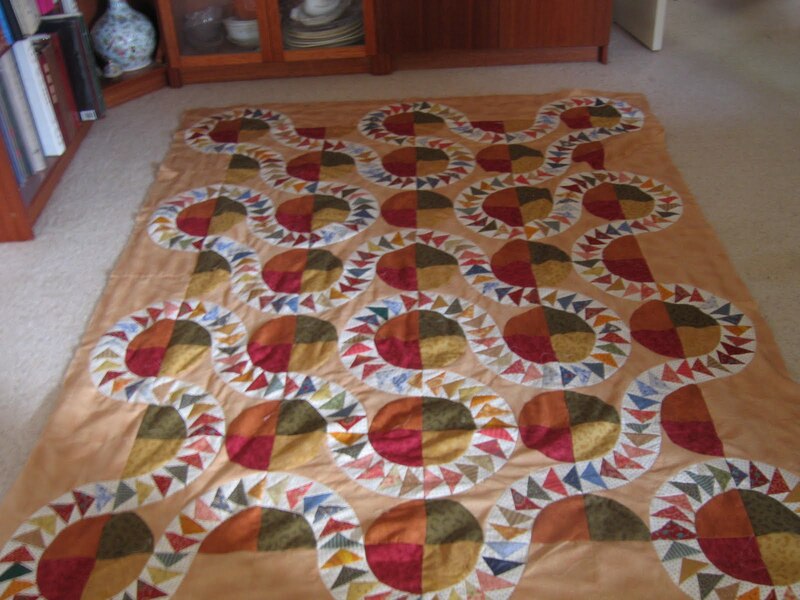 We have a different quilt, Summer Whispers, for this year's raffle, along with three other prizes for accommodation at various places around the Goulburn area. 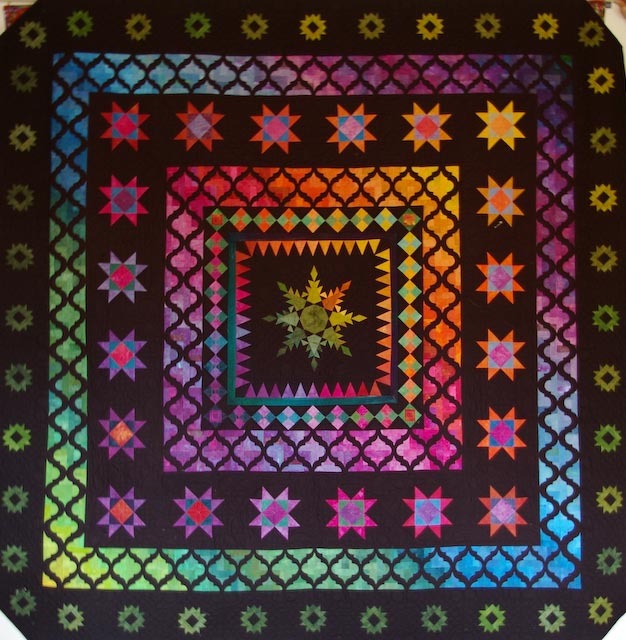 Spring Explosions will be next year's raffle quilt and I will remind anyone who comments that they would like a reminder. Found this cute little key chain holder while killing time today. Instructions and patterns are provided here if you are interested in making it. 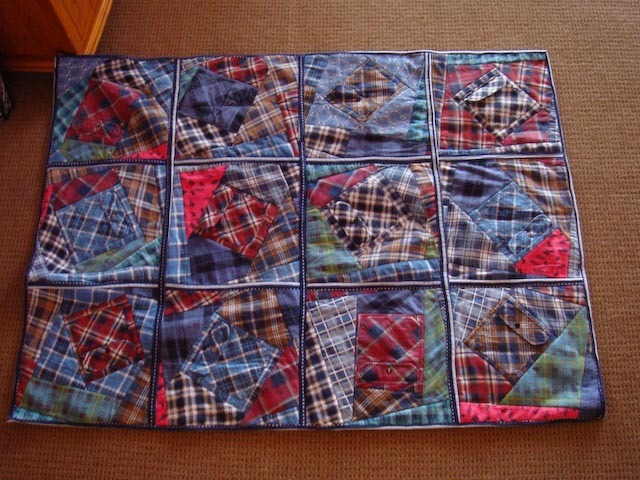 Earlier this year I attended a retreat where the challenge was to make a quilt using only recycled flannel shirts. 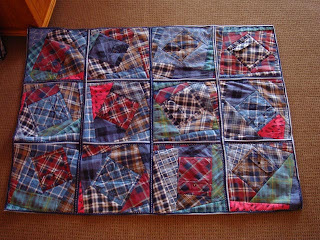 A friend of mine donated a pile of unwanted flannel shirts to the project and from twelve of these I made this beauty? It was a lot of fun and quite a quick quilt. I could have made it as a QAYG but when I started it I had no idea what I would do ..initially it was to be a square in a square but i found this too boring after adding just four or five pieces. Also I didn't want it to be a project that I needed to stress over. So although the principal is square in a square the process is nowhere near as accurate. 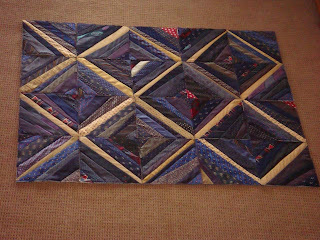 The separate blocks were quilted and then it was put together using a second hand pair of men's pyjamas for the sashing in a QAYG method. I am really enjoying the freedom and ease that the QAYG process allows and am actually improving. My latest quilt you can't even tell it was QAYG as there is no sashing on the front nor the back. Well it has gone to the printers!!! What you might ask? 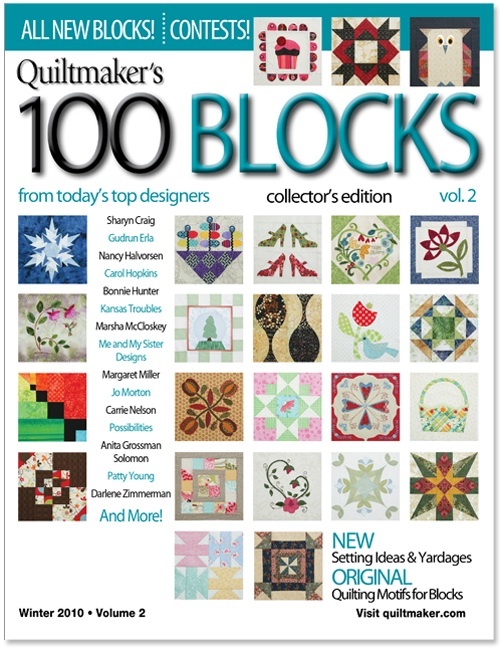 Well the second issue of Quiltmaker's 100 Blocks from Today's Top Designers.... check out the cover here! None of those beaut blocks on the cover are mine but they show you some of the variety that will be inside. Yes I know it sounds like a brag but I am just so thrilled to actually be in the magazine that I had to tell someone. Lucky you? I submitted two blocks for the magazine and don't know which one will be in the magazine so can't wai. The magazine is due out early November and at that time there will be a blog tour where you can win copies of the magazine, so be sure to check back here. I don't know yet what the requirements will be to win but it won't be too hard. 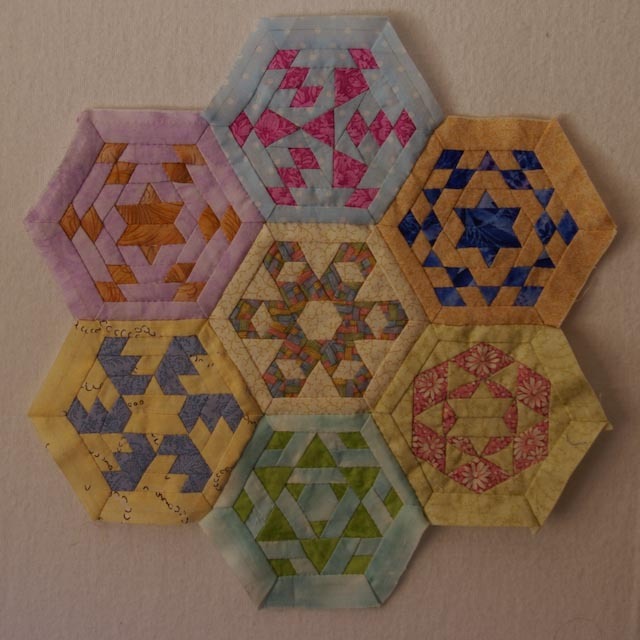 Well I have been busy sewing and have almost finished all 287 hexagons for my next quilt.. only ten to go and then replacements for any which I don't like the fabrics. So hopefully all of the individual blocks will be finished by the end of the month. Then I need to make the half blocks for filling the side gaps and then work out what to do on the borders. 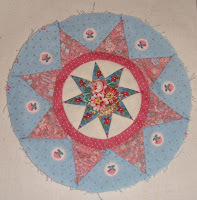 Well I would love to say that I have finally finished my feathered star but alas that is not the case. 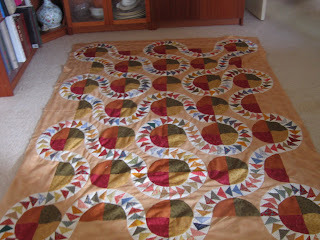 However I have finished most of it and so figured I would post a picture with requests for quilting ideas. 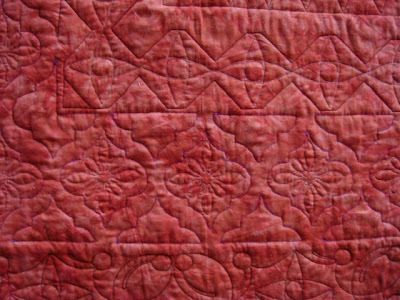 As can be seen from the photo (hopefully) I have echo quilted the inner sections but I am unsure as to what to do with the outer sections. I have drawn several lines trying different ideas but haven't been happy with any. 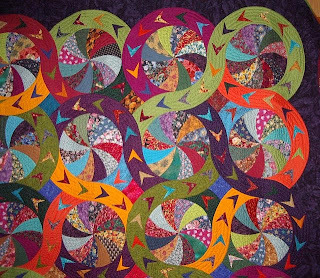 Now as may be seen from the quilting I am slightly, ok let's be honest greatly, restricted by the fact that I couldn't free motion quilt to save my life or even yours. 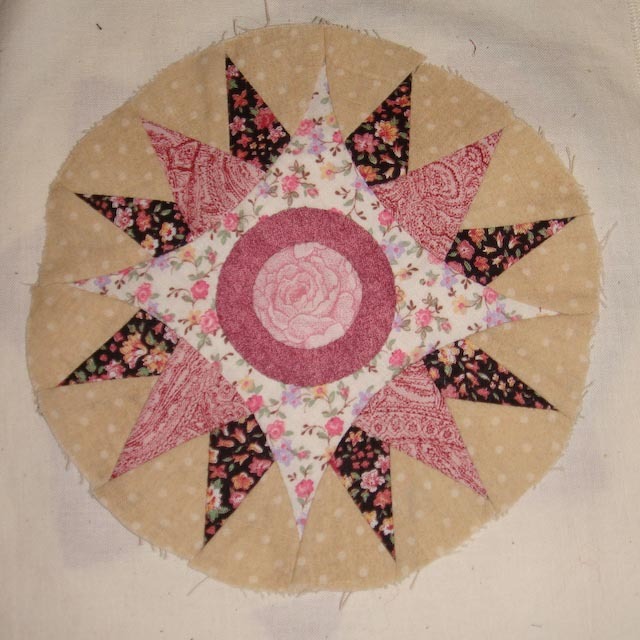 Thus the quilting will need to be something that can be completed with a walking foot! Well it has been a while since I flaunted but I have been busy. I know you will find this hard to believe, but I have now finished four of my 10 in ten projects. 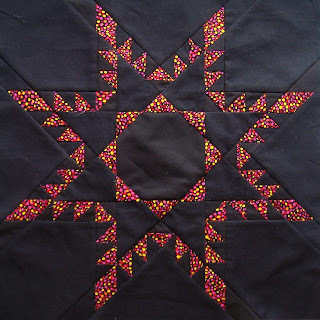 Over a month ago I finished the quilts for the twins so 5 and 6 were gone; I completed a calendar quilt a couple of weeks ago so there goes 9; and the biggie of them all is Turkish Delight, number 3, which I will finish today.... I wrote this post last night and by the time that this post is uploaded I should be finished ... or well on the way to finishing it. 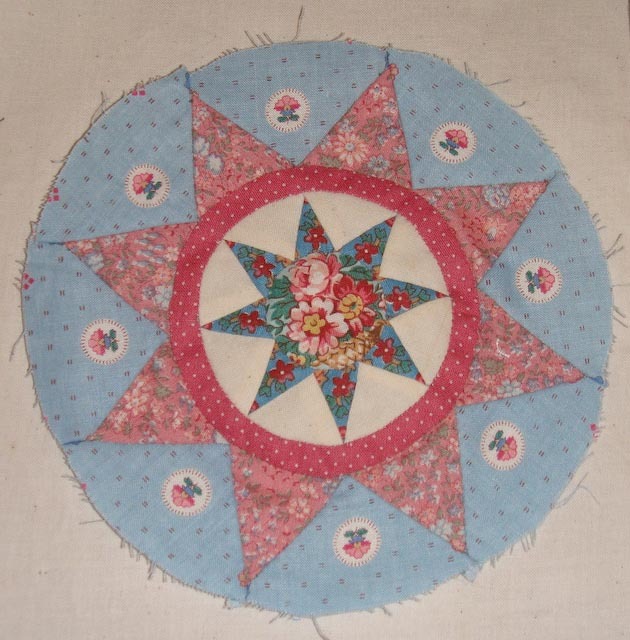 I had parts of it professionally quilted and then added extra bits which I felt it needed and all in all I am now very pleased with it. 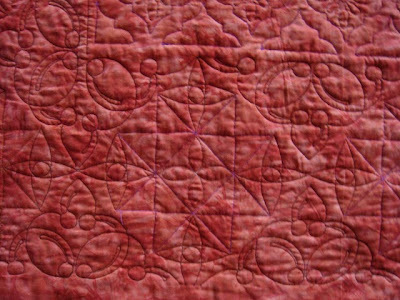 The pictures that I have here are of the back which shows the quilting up beautifully I feel. So four down and only six to go. 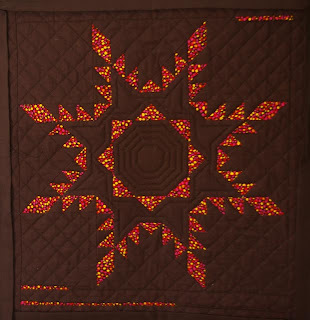 I have had numerous requests for this pattern on my website but when I explained that it was king size and not easily modified people asked if I could design a similar quilt for queen sized beds. Here it is - Highways! 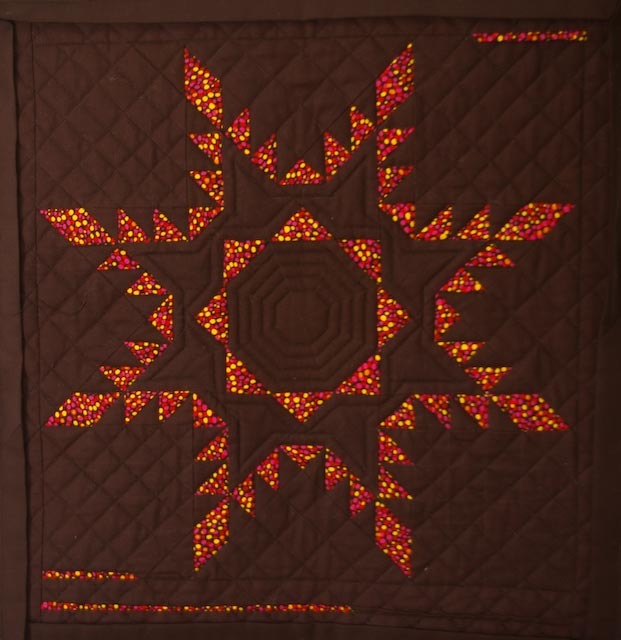 Well actually the photo is still of the original king size quilt, Trails. I must admit that although I have finished the queen sized pattern.. and had it checked over I am still in the process of actually making the sample. 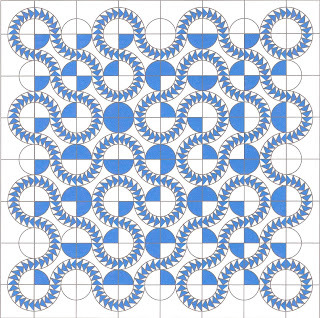 Highways has only 16 circles and 24 paths and so it has to be quicker to make than the original. I am hoping that one of the people who buys it, works faster than I do. 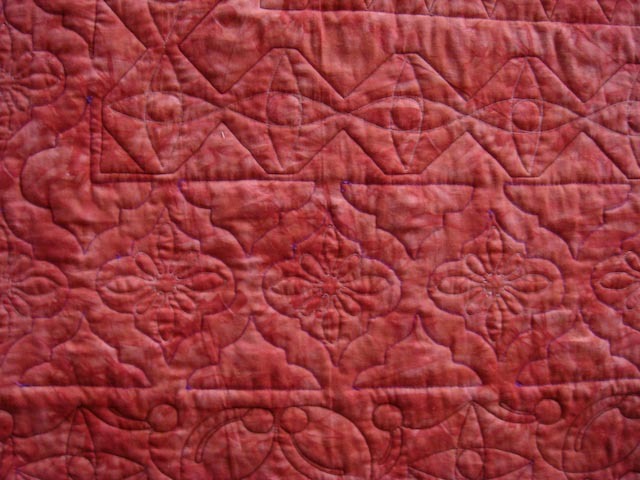 If I am very lucky when finished they will also be happy for me to use their quilt photo on the website. We will have to see. Anyway even if you don't want to buy a pattern check out the website. I like it! Well in case you haven't seen Christine Abela's latest email about her newest website the news is "it's mine!!" Christine has been working VERY hard to iron out some 'small' (well big really but I hate to admit it :) errors which I somehow incorporated. After a few very late nights.. thank you Christine, my web site is now live. If you have some time to spare, check it out and let me know what you think. Personally I love it AND I am totally unbiased, well maybe a little bit. 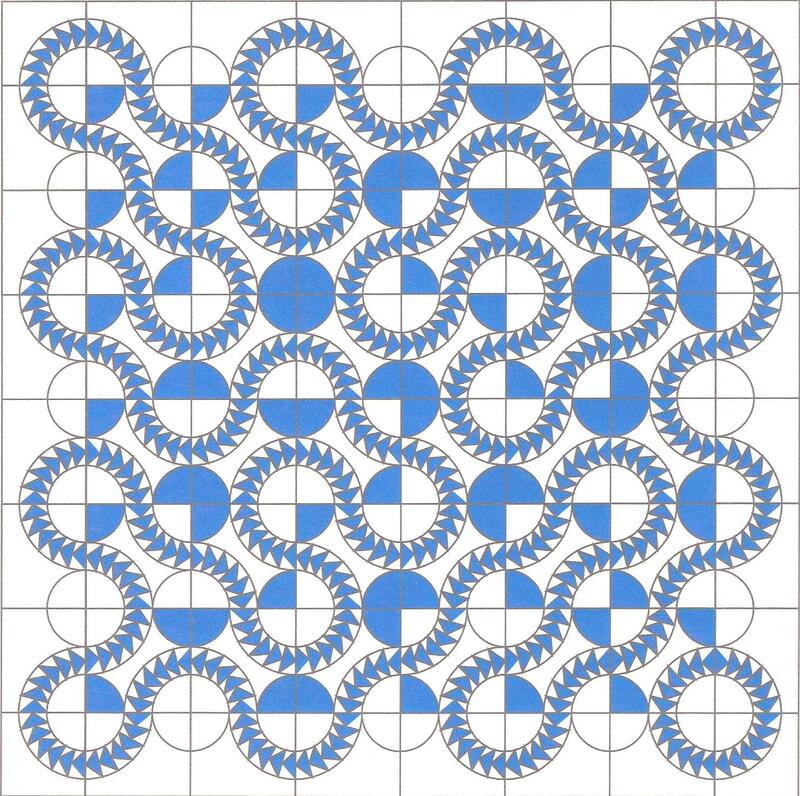 I still have a lot of patterns to write up and so am planning on uploading a new one at least fortnightly but hopefully weekly until I finish. I really should have put my head down last year and done it while I had the time off but the year just flew by. By the way if you are thinking of having a website made I recommend Christine completely. She is very professional and works to what you want. Very helpful and prompt.... hey you know she is one of those people you like to work with. Once a month I teach at the Quilters Garden in Albion Park and one of the students has been doing a variety of my quilts throughout the last 12 months. Anyway last month she selected one of my Flying Geese designs. 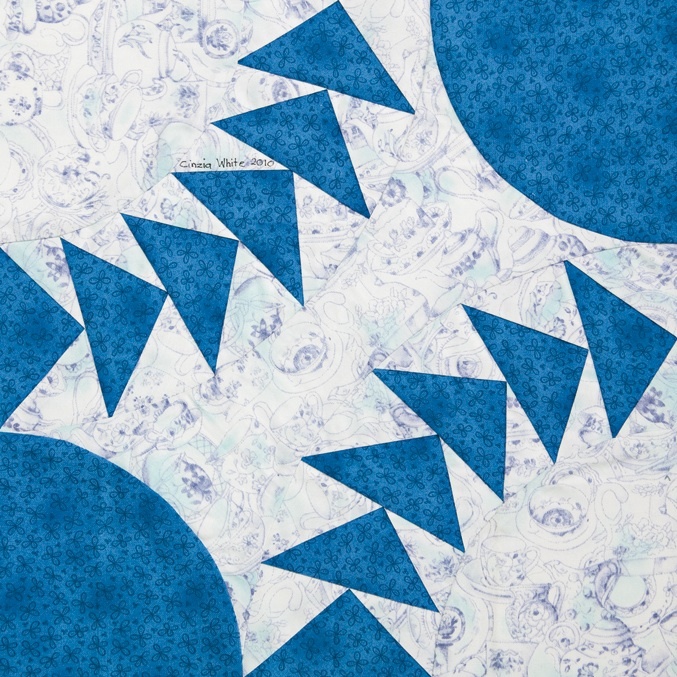 However, I felt it would be too simple for her and so offered to design a mystery quilt with Flying Geese for her and she was quite happy to go with that. 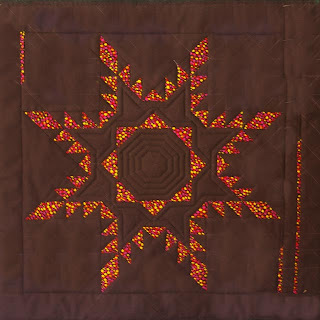 This is the first block in the quilt. Yes I realise you can't see any Flying Geese there but they will come I promise... in the border! Well this should have been my flaunt last week but I was too flat out to upload it in time. Finally finished two of my 'ten in 10' resolutions, numbers 7 & 8. 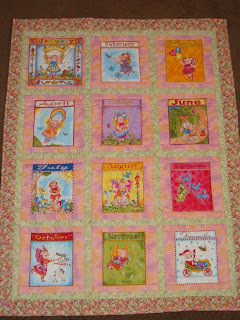 The other quilt used the same calendar panel but was framed with different fabrics. As of Tuesday, when I wrote this blurb and set it up for automatic posting, the twins are yet to be born. They are now at 39 weeks, which is phenomenal since both look like being well over 6lbs a piece. The doctor intends to wait until labour starts naturally and Sara is really huge and uncomfortable. 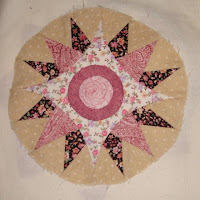 have just started to work on my quilt for this year's guild challenge and have discovered that I am a little short on fabric. I need one 2 3/4in square if anyone has any to spare. Please leave a comment below, with your email address, if you have some and I will get back to you. I won't publish your email. You can't spend a summer, disguised as a man!" I won't have a biscuit, not even a lick.